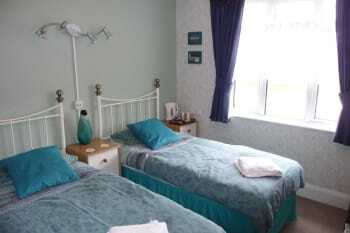 Award winning High Ways House is a small, friendly, family run rural Guest House with free parking. 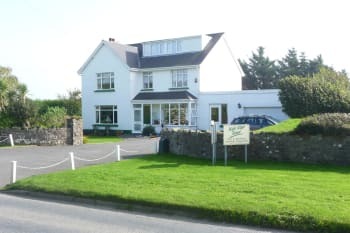 Away from the hustle and bustle, the stunning location with its panoramic, countryside and coastal views is conveniently situated between Ilfracombe and Woolacombe. 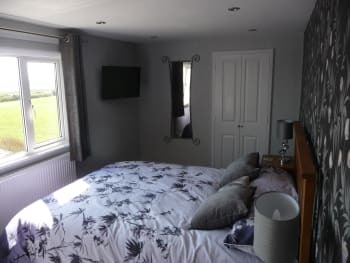 This is the ideal base for exploring the beauty of North Devon but close to the beautiful beaches of Woolacombe, Croyde and the bustling harbour town of Ilfracombe. This licensed Guest House with free WiFi offers home from home comfort and traditional breakfasts, catering for all needs. Also for your relaxation, a comfortable lounge and sheltered garden where you can unwind and watch the beautiful sunsets. New for 2017 we have a well appointed suite with its own sitting room for those who want that little extra, with a choice of other individually decorated room types available with either en-suite or private shower rooms High Ways can accommodate all your needs. You will be welcomed with tea and cake on arrival to start your break. There are no rooms available at High Ways House for these dates. Chris and Derek were very welcoming. The food was excellent; delicious cake and tea on arrival and fresh fruit with breakfast were the highlights. We would certainly stay again if we are in this part of Devonn. Very nice place (out of town), but handy for Woolacombe, Ilfracombe and Mortehoe. We had decent pub food at the Chichester Arms in Moertehoe. Excellent service and my gluten free vegan daughter was extremely well catered for at breakfast, with a wide choice of options and gluten free vegan biscuits were even supplied in the room. 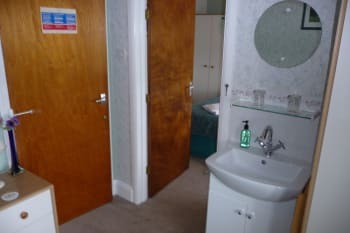 The room was clean and well equipped and the bathroom toiletries were supplied. The hosts were very welcoming and I would definitely stay here again. Very pleasant. Very good food. Pleasant and welcoming couple. Would certainly stay again. 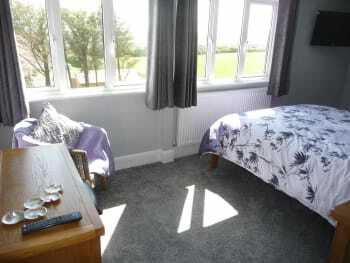 Very friendly and welcoming, breakfast excellent, fantastic room spacious and great views. Have a brilliant stay. Mortehoe lovely. Ate at Chichester Arms very nice meal. Great welcome with tea/coffee/cake appreciated. Breakfasts - fantastic, huge portions - last all day! 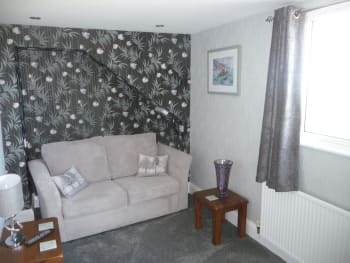 Comfortable sitting room with books/magazines/games/TV which could be used any time. Lovely large fluffy towels! 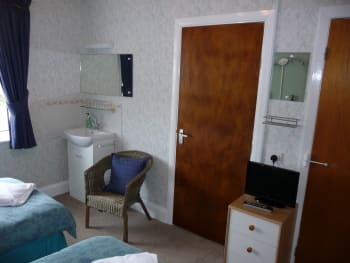 Bedroom with all usual facilities, plus extras like the voluntary provision of plates/napkins for snacks, extra coffee and fresh milk! Fresh flowers and fabric napkins and tablecloths! A high standard in all respects, the hosts could not do enough for us. Restaurant fifty yards away. All the facilities and entertainment from several interesting seaside towns within a very few miles. Zoo, Wild-life park (though not very suitable for wheel-chair users as terrain spectacular but with very steep gradients; Swimming pool; An excellent place for a holiday for adults and children. Very nice comfortable B&B. Very warm welcome from Derek and Chris. The tea and cake on arrival was very welcome. We really liked our room with its own sitting room. Try Ebrington Arms at Knowle and especially the garlic mushrooms (one portion is more than enough for two) and the main meals are huge. We also liked the Ship Aground at Morthoe. Very friendly and warm hosts. What a lovely welcome from Chris and Derek, we had a cafetière of coffee and delicious Victoria Sponge on arrival, much needed after a 6 hour journey. We were staying in the suite which was fantastic, bedroom, bathroom and sitting room. There was a t.v. In the sitting room and in the bedroom, so no argument when the football was on. The breakfast, well there was everything you could possible want, fresh fruit, yoghurt, cereals, juice and a good choice of cooked breakfast. May I say the best poached eggs I've had, so good I had them every day and my husband loved the full English. Chris and Derek were so friendly and nothing was too much trouble. The location was great for us as it is on the road between Ilfracome and a Woolacombe with their own parking. This was great for us as parking can be a problem in the towns and we could head off in either direction as the fancy took us. Lovely hosts and felt very welcome. Absolutely superb place to stay & explore the surrounding areas. The suite wS spotlessly clean & the breakfasts were to die for. Can recommend with confidence. Short distances to Woolacombe or Illfracombe lots of good places to eat, St James tea rooms in Illfracombe, Tides Inn, The Fortescue, & The Boardwalk in Woolacombe. What a lovely 4 day stay we had! Derek and Chris are perfect hosts, we were greeted with delicious homemade cake and coffee. The breakfast was amazing, fresh raspberries,strawberries,blueberries etc. The full english was delicious, very filling and constant refills of coffe,toast if you wanted it. We had the suite at the top of the house, it was so comfortable and warm ( as unfortunately a bit chilly the days we stayed) The views from our windows back and front were amazing. We wouldn't hesitate to go back to High Ways House next time we visit Devon. RHS Rosemoor is well worth a visit, Arlington Manor also just to see the Golden Coach totally beautiful. A lovely stay with friendly hosts and a great breakfast. Perfect for our trip. Cannot fault in any way. Would recommend and we will definitely go back. This was booked at the last minute and was further from town than we wanted. However, the owners were very freindly, the place was very clean, quiet and the breakfast was good. Very welcoming and excellent breakfast. Kippers were absolutely delicious. Very welcoming and wonderful food. 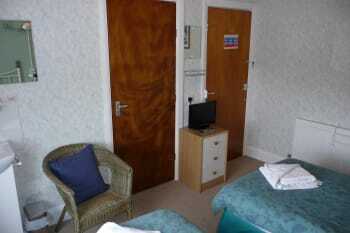 The bed was extremely comfortable and the facilities were excellent. Arrive before the end of May and park at Woolacombe on the road for free. Changes 1st of June. Easy to find, impeccably clean and welcoming as well as the breakfast being excellent. On arrival, Chris's victoria sponge was delicious. 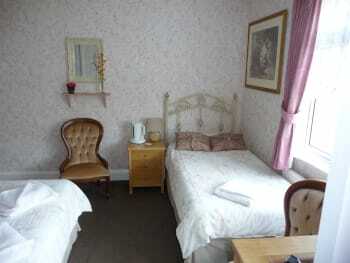 Everything you need from a B & B at a reasonable price. Thanks, Derek and Chris for a lovely stay even though it was shorter than planned. Hopefully we can stay longer next time. Extremely friendly and helpful, it's like staying in someone's home as opposed to a hotel. Rooms comfortable and a good size. Breakfast was first class. Polite, friendly & helpful owners made to feel very relaxed. Clean, comfortable room would highly recommend. Good places to visit in the area include Marwood Hill Gardens, RHS Rosemoor Gardens, Clovelly, Lynton and Lynmouth. We struggled to find good places to eat in the evening not knowing the area well but Derek and Chris's suggestion to eat at the Smugglers in Ilfracombe was a good one and we ate there twice. We wouldn't recommend the Muddiford Inn as food wasn't very good and we also ate at the Beggars Roost near Lynmouth which was ok. Very good stay. Friendly and do everything possible they can to make the stay great. An enjoyable stay at the High Ways House. Derek and Chris were very welcoming hosts and we thoroughly recommend the meals. Lovely relaxing place, fantastic friendly hosts. Cracking breakfast. we really enjoyed our stay. The breakfasts were delicious. we were given lots of very helpful advice about walks to enjoy in the area and places to eat from the very friendly owners. We enjoyed out stay. The owners were very friendly. The breakfast was very good. Only a few minutes drive to Woolacombe and Ilfracombe. Only stayed for 2 nights, but didn't want to leave, I was staying as a single guest and made to feel really welcome, I can't wait to visit again, roll on next time! very comfortable room with everything I needed. Coffee/tea, T.V. Small but adequate shower. Warm welcome from attentive hosts. Free parking. Decor a bit dated but on the whole good value for money. Welcoming, clean, excellent breakfast, all you could want, nothing too much trouble, will return, many thanks. Chip shop in Morthoe lovely chips but be prepared to queue, generally everything in Woolacombe is great just enjoy. Lovely place. Friendly people. Would definatley stay again if in the area. Very welcoming hosts. Accommodation is excellent. Breakfast to die for. ( a good choice of food ) room was a very high standard. And a fabulous views of the countryside . 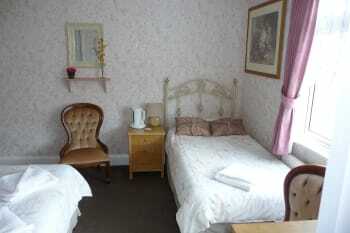 If you don't book a stay in highways guest house you will miss out. See you soon Terry/Amanda Harper. Go in to woolacome after breakfast. Delightful and friendly hosts. We felt very welcome and importantly, relaxed during our stay. The breakfast was delicious, with fresh fruit to hand. The full English Breakfast was excellent and kept us going all day ! Although only a B&B the sign outside says it is a fully licensed restaurant. We were therefore surprised to be told they do not do evening meals. So we had to get back in our car and drive around to find somewhere to eat. There are two good pubs in Mortehoe both serving food. Unfortunately on a Sunday in mid August they were both packed out. We had to wait over an hour for our food. Perfectly run and very clean and enjoyable stay. Thank you. Ask Chris and Derek as they have a wealth of knowledge of the surrounding attractions. The hospitality from Chris and Derek was superb, striking a great balance of being attentive without being overbearing. They are natural hosts and made me feel very welcome. 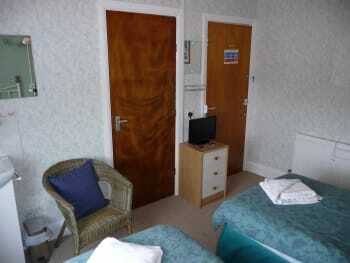 The facilities are tidy and clean, nicely decorated and great value for the price paid. The breakfast is cooked to perfection, with quality ingredients, and I left the hotel full every morning! I have absolutely no reservation in recommending High ways hotel to anyone for quality and value. It will be my first choice if I am ever in the area again. Chris and Derek were very friendly and welcoming. The breakfast was excellent and the room was comfortable and clean. The Rock gastro pub in Georgeham was excellent for food. Appledor is a must see. Very welcoming and helpful hosts. Accommodation was very clean and breakfasts were excellent. Nothing too much trouble and knowledge of local area very helpful. 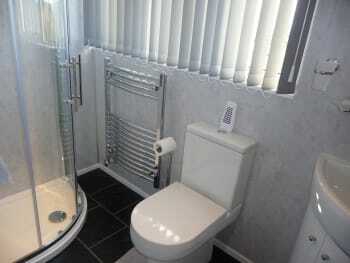 The house is situated in a very good location, providing easy access to local attractions. Plenty of places of interest, and good availability of restaurants etc in the surrounding area. Our charming hosts were warm, hospitable and relaxed; very accommodating, and nothing too much trouble. Establishment extremely clean. Bed very comfortable. Breakfast of extremely high standard. We will visit them again. Amazing scenery for walkers. Do visit Clovelly (wear flat comfy shoes with grippy soles!) and Tarr Steps. Chris & Derek are excellent hosts and very friendly and willing to help their guests. We felt very comfortable with them and would give their breakfasts 5*. The room was ideal and the stay was just what we needed. 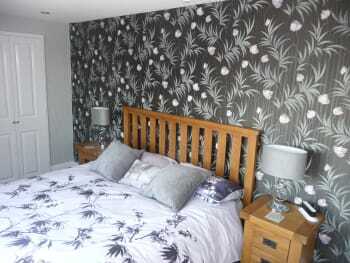 Lovely welcoming hosts , comfortable beds plenty of space to relax. The breakfast was second to none everything on offer one could wish for. A visit to Woolacombe is a must. Very welcoming and friendly hosts. Great advice from them about surrounding area and places to visit. Superb breakfast with fresh fruit and other local produce. An excellent short break for us. Just ask the owners they have lots of tips and knowledge of the area. Places to eat, walks, attractions etc. I thoroughly enjoyed having the chance to get to know you and really appreciated your welcome [much needed tea and cake! [QUALITY** HOME-MADE** CAKE!]. I slept well, loved the fresh-cooked breakfast and your generosity with tea, toast ,fruit and in -room biscuits. Get fish and chips in Woolacombe from the busy chippy. Then drive up to the car park which overlooks the beach [ your hosts will know the one], get some folding chairs out of boot [or behind the seats dependiing on your vehicle] and eat your cod and chips while watching the sunset. [WEATHER AND FOOD PREFERENCES PERMITTING]. As my mate says "LUSH!!!" Jon and I would like to thank you for a wonderful stay. We thought you were friendly and very helpful and accommodating. We received very good advice on where to go and where to park. We particularly found it useful to have our own key so that we could come and go as we needed. I would also like to say a very big thank you for arranging the birthday cake. 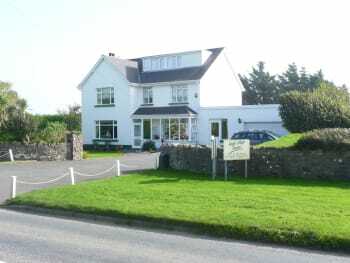 High Ways House is perfectly located and takes only a few minutes drive from woolacombe and Ilfracombe. We ate at several different restaurants and all the food was amazing. The fudge and clotted cream ice cream is highly recommended! We had an amazing time and we hope to return for another holiday soon. Made very welcome on arrival. Would recommend high ways house . Such a wonderful and welcoming couple who go above and beyond to meet your needs. We will definitely be back! We were made most welcome throughout our stay and had a great beak. Excellent room, breakfast and hospitality. . Would deffenitly stay again. Need a car to get about, public transport poor and no pavement to walk on, that's the only downside, everything else was spot on. We felt very welcomed by the friendly owners, Breakfasts were excellent. We would stay gain when in the area. Mort hoe pub the Chichester Arms and the Ship aground had good food, also the Take away is worth a visit. Great friendly welcome, breakfast was first class and set you up for the day. if I had to find a small fault it was that the bedroom we had was quite small and at the top of the house, but I would highly recommend this as a holiday destination. Chris and Derek, These are the good proprietors of this Guest House are very welcoming at all times we really felt at home nothing was too much trouble every thing was carried in a very friendly manner. We would certainly stay there again. Breakfast is excellent and very tasty. This is one of the best accommodation we experienced. Well done Chris & Derek sure visit again. Squires, Fish and Chips Restaurant is excellent and the wine is good also. Immaculately clean, warm welcome, excellent breakfast...... What more could you want?! Hire a beach hut on Saunton Sands for the day during the season. Bargain. You have taken into consideration the needs of vacationers so you provide the little things like the clothes line! I enjoyed the sitting room for reading. I just recommend this establishment and and the folks who run it. LOVELY PLACE LOVELY COUPLE FELT WELCOME AS SOON AS WE STEPPED THROUGH THE DOOR. A perfect stay, we would not hesitate to come again! An excellent service, we felt like part of the family!! We would definatly reccomend High Ways House to our familyand friends! Cooks Island pub is near and very reasonable, The dolphin restaurant chip shop in the town is fab too! Warm and very friendly. felt totally at home and treated with great hospitality. Fantastic stay! Would go back and recommend this B&B to anyone. The owners Derek and Chris are wonderful so helpful and friendly. Was such a warm welcome with pot of tea and homemade cake offered, which was a lovely treat and something special about stopping there. Breakfast was lovely great food and cooked perfectly. 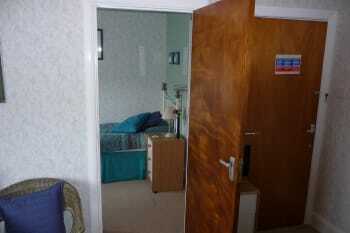 Rooms are what u need very clean and tidy. The owners were just lovely and helpful. Breakfast was great. 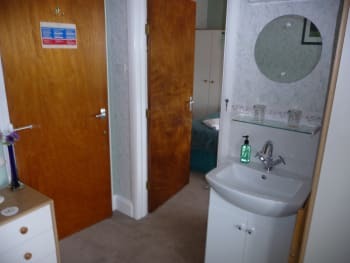 The room was spotlessly clean with a teeny ensuite. It was a little old fashioned with some crazy decor combinations! 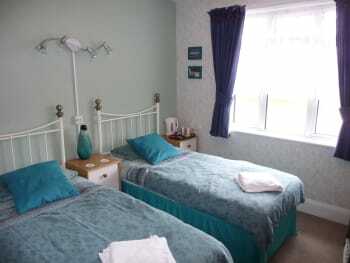 The house is located quite a distance from both woolacombe and ilfracombe so not walking distance. We had planned to cycle but the rain stopped us from doing this, particularly in the evening for dinner. The bus service did not seem to run in the evenings so we ended up driving to get to nice places to eat and consequently no boozy drinks! Having said that if you plan on driving everywhere then it's perfectly placed between the two towns. There is a fab seafood restaurant in ilfracombe called 'espresso' that offered fresh local produce. Woolacombe just seemed to offer lots of fast fried food, albeit nice. Really enjoyed the local farm,sheep handling and falconry display. Found lovely pancake shop just off seafront in Woolacombe owned by Dutch folk. A lovely little place with hosts that were so helpful and real genuine people. They made us feel very welcome and I thoroughly recommend as a place to stay if you want to hit the beach. Only 2,5 miles away to the best beach in the UK so not a bad spot at all. Spotlessly clean. It was lovely to be greeted with coffee and home made cake. The breakfast was delicious, beautifully cooked and a good variety of fresh fruit and cereal, and the homemade bread was amazing !! There is a shorter route to/from Croyde that the owner told us about which made life easier. The house is well located for exploring the area. The smugglers restaurant at Ilfracombe Excellent. Marwood hill gardens worth a visit. Chris & Derek made us feel so welcome, gave us lots of local information and the breakfast was amazing! 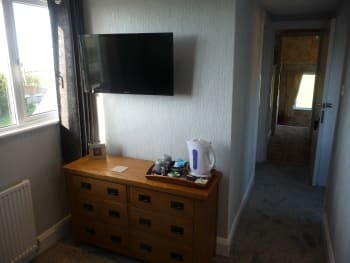 Woolacombe with its lovely beach, Mortehoe, Lee and Ilfracombe with is lovely harbour ,restaurants and fantastic scenary are all very close so is an ideal location. Lynton & Lynmouth are also a must and again just a short drive. Lovely hosts, tea and cake on arrival. A fantastic breakfast. Only needed a softer mattress for us. A day in Ilfracombe is a must. I can ecommend this place in no better terms than previous reviews. All i will say that the welcombe Victoria Sponge on arrival and the freshly brewed tea was so welcombe ....And the tea pot had 3 tea bags,that in iteslf speaks volumes for a good stay !!!! you must go to ilfracombe and and see verity ???? Thank you so much for a lovely stay and your local knowledge was invaluable. 11 The Quay - Damien Hurst's restaurant, we had a fabulous meal and the staff were great. Appledore definitely worth a visit and of course Clovelly - a beautiful cobbled village and scenic harbour. Had a fabulous stay. 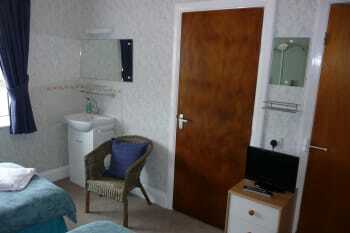 Lovely clean accomadation with good facilities. Hosts were extremely friendly and welcoming and pocessed an outstanding knowledge of the local area. This guest house cannot be faulted......10/10! Go to the 'The Thatch' in Croyde...fantastic food, but book a table before hand! Upon our arrival, we had a very warm greeting from our hosts, Derek and Chris and were given tea and cake (beautiful), which was a welcoming surprise, in the communal lounge and we immediately feel at home and chatted to them and their friend for quite some time. 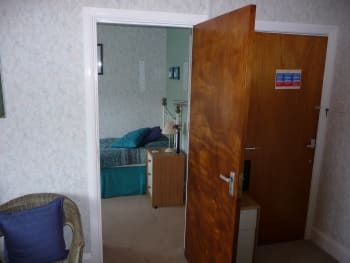 Our room was just perfect in every respect, being beautifully decorated and pristine, with a lot of attention to detail and quality of furnishings, including ornaments and a splendid picture above the bed. The breakfast was a real treat and of a standard that couldn't be bettered, with a vast choice, including fresh strawberries and raspberries. The full English breakfast was a feast for the eyes apart from the stomach and be assured that you won't go hungry during your stay. Derek and Chris are very knowledgeable about the local area and beyond and will give good advice on places worth visiting. They certainly helped us. Although we only stayed a few days and it was our first visit there, we felt it had been longer and had gained two new friends. It was sad to leave, but I know we will be back. A good central spot for Woolacombe beach, Ilfracombe, Barnstable and surrounding countryside. Lovely stay. Chris and Derek very welcoming. Breakfast very good. Will stay there again.